The Miracle of Fatima Mansions traces a young man’s terrifying descent into a life of drug addiction, crime and prostitution, against the backdrop of the cultural and sexual revolution of the 60s and 70s. Drawn by the bright lights and emerging drug-scene of ‘Swinging London’, Shay Byrne left his native Dublin to immerse himself in his new found-freedom. Drifting between the vibrant squats in Hampstead Heath, he soon sank into a life of drug addiction and petty-crime. Returning to Ireland, his life took a dramatic turn when he narrowly escaped death during a violent attack at the city’s squalid Fatima Mansions estate. Fatima Mansions represented a leap into a brighter future for the city’s working class. But the dream was short-lived, and by the late 60s it had become synonymous with extreme social depravation, drugs and urban decay. This would be the unlikely location of an epiphany that would transform Shay’s life. Slowly rebuilding his life, the author had to deal with the physical and mental damage caused by long-term drug abuse. 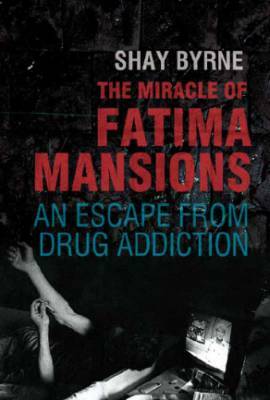 The Miracle of Fatima Mansions reveals the true legacy of the 1960s drug culture.